I'm jumping a bit in time right now because I really want to share this simple, easy-to-make recipe. Basically, this is your ole fashioned buttered pecans. Real. Simple. 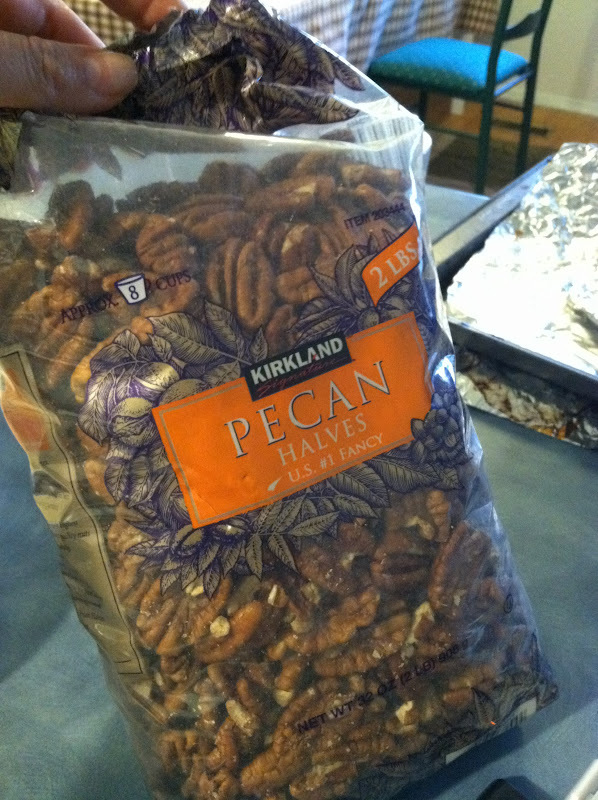 So you start off with some pecans. My Dad loves to get the huge bags of nuts from Costcos, so that's what motivated to cook this (cuz if I don't, no one will bother to eat it). Using a high-speed mixer, whip up one egg white. Don't waste - use the yolk for fried rice or an omelette for your next meal. You have to whip it until it's nice and foamy. I've never done this before, only read it in cooking blogs. 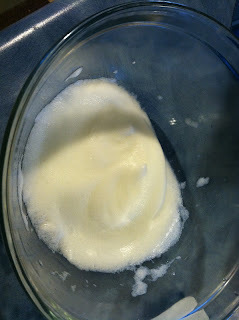 But it's real easy - just whip, whip and whip away, and you've got yourself a nice, foamy egg white mixture. Then dump your pecans or walnuts in there and coat evenly. The recipe called for 4 cups of pecans, but I just eyeballed it according to the size of my bowl. 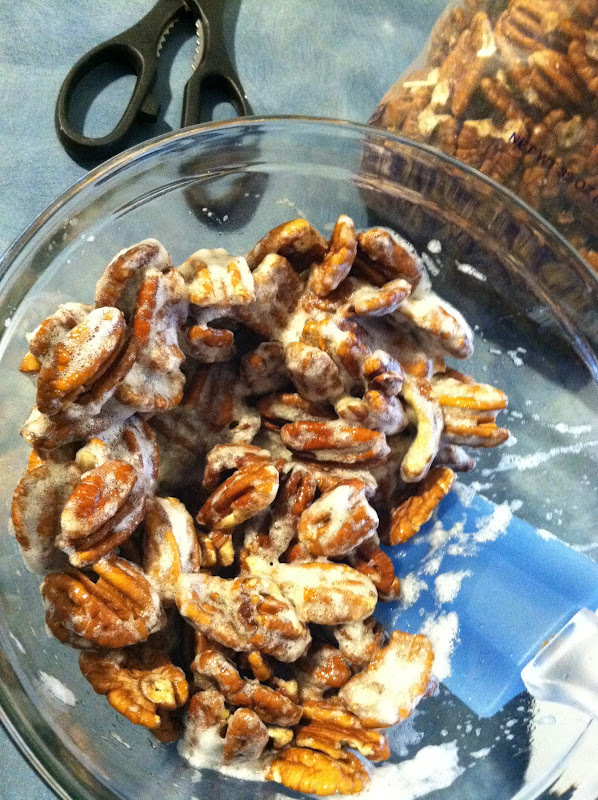 Then mix in around 1 cup of sugar - here I used 1/2 cup of brown sugar to camouflage with the pecans - and a teaspoon of salt. Spread it out evenly on a greased baking sheet, and pop it into the oven at 250 F. It's done in an hour, and you don't even have to poke it around every so often. And the taste is delish! I was actually really surprised at how salty it was with a pinch of salt, but I figured later it's because of the egg whites that made it even saltier. 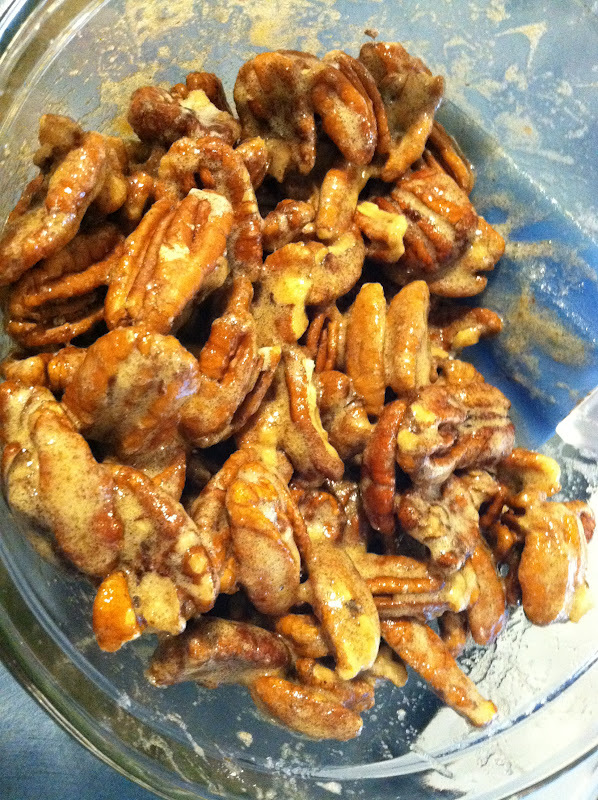 It was also a bit spicy for some reason, possibly because of the pecan's skin coating that reacted to the coating. I wished I had put a bit more sugar in, but alas, for the sake of the waist line. It was a huge hit - both my cousin and Dad loved - and I mean loved - this. My cousin even told my Mom to put it away before it's all demolished. 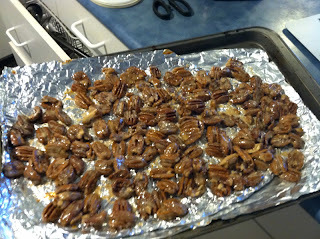 I didn't even manage to save some for hubby (as evidence that yes, I can roast pecans! So please buy them for me at Costcos ;).